Since its discovery over a century ago, the Antikythera Mechanism has had scholars scratching their heads over how the Greeks managed to build a mechanical computer a hundred years before the birth of Christ and thousands of years before anything similar. But now things have become even stranger as researchers claim that it’s over a hundred years older than previously believed and may have been built by a famous hand. The Antikythera Mechanism was discovered in 1901 by sponge divers off the Greek island of Antikythera. At first, not much was made of it, but after the coral-encrusted, corroded mass of bronze gears was later studied using x-rays, gamma rays, and neutrons, and then reconstructed, it turned out to be something astonishing. The device at first was thought to be some sort of surprisingly early clock, but then it turned out to be the oldest computer known. In fact it was an analog astronomical computer based on the principle of the differential calculator that uses gear trains as a way of performing complex calculations. On further study, the device proved capable of calculating, among other things, the position of the planets, sidereal time, and eclipses. 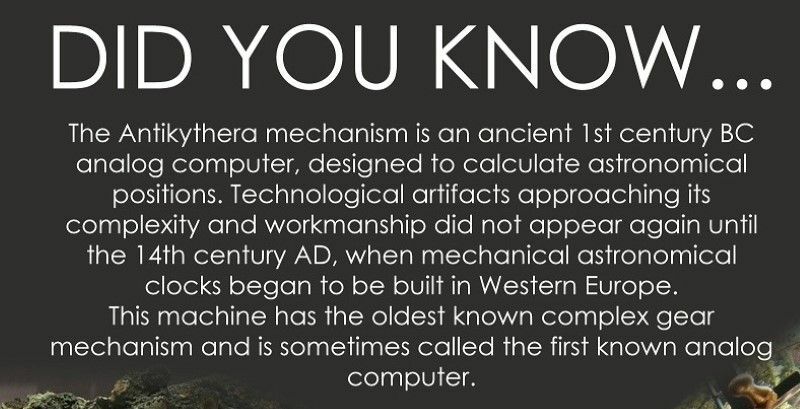 And all of this by using technology that was never realized to exist in the ancient world and after it vanished, didn’t reappear until the 14th century. Even today the device sparks interest as the design is adapted to not only museum exhibits, but also watches. First reported in the New York Times, the new date for the Antikythera Mechanism is the result of work by James Evans, professor of physics at University of Puget Sound, and Christián Carman, history of science professor at University of Quilmes, Argentina. The new date is based on a reconstruction of the device made by John Steele of Brown University in 2008. This involved matching the calculations against Babylonian eclipse records and applying an analysis that took into account lunar and solar anomalies, solar eclipses, and lunar and solar eclipse­s cycles that might have been missing and other inaccuracies – not the least of which might have been caused by the fact that much of the device was never salvaged. By a process of elimination, Evans and Carman eliminated hundreds of eclipse patterns until a match was found that placed the earliest eclipse on the device matching the year 205 BC. According to the researchers, such a date not only places the manufacturing date perhaps a hundred years earlier than the previous date of about 100 BC, but also indicates that the mathematics used to design the device were derived from Babylonian methods rather than Greek trigonometry, which did not exist at that time. The researchers also put forward another tantalizing possibility opened by the new date. According to Cicero, there was a story that a device much like the one found at Antikythera was made by Archimedes and captured by the Roman general Marcellus after the sack of Syracuse and the death of Archimedes in 212 BC. It is remotely possible that it and the Antikythera Mechanism may be one and the same. The researchers emphasize that the correlation is conjectural, but it does suggest that the age of the device is not only now known, but that a famous name can be given to its maker. The results were published in the Archive for History of Exact Science.